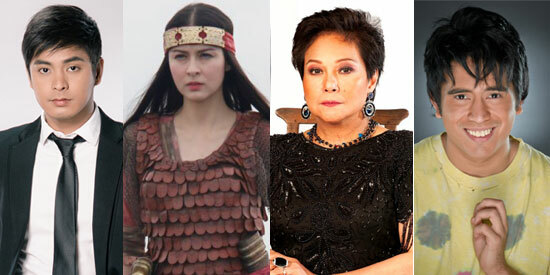 2013 Golden Screen TV Awards nominees: (from left) Coco Martin in Walang Hanggan, Marian Rivera in Amaya, Nora Aunor in Sa Ngalan Ng Ina, and Gerald Anderson in Budoy. The Entertainment Press Society (ENPRESS, Inc.) announces the nominees for the 2013 Golden Screen TV Awards. ENPRESS received more than 700 entries of various programs from different TV networks and after more than three months of review, it is now time to reveal the finalists in the 51 categories. The period covered for the nominations is from July 1, 2011 to June 30, 2012. The awards night of the Golden Screen TV Awards 2013 will be held on March 1, 2013 at Teatrino, Promenade, Greenhills Shopping Center, San Juan City. Easily the most exciting and hotly-contested are the nominees in the acting categories. Vying for the Outstanding Performance by An Actor in a Drama Series category are: Alden Richards (One True Love), Coco Martin (Walang Hanggan), Dingdong Dantes (My Beloved), Gerald Anderson (Budoy), Jericho Rosales (Dahil sa Pag-ibig), Piolo Pascual (Dahil Sa Pag-ibig), and Richard Gomez (Walang Hanggan). Contenders in the Outstanding Performance by An Actress in a Drama Series category are: Alessandra de Rossi (Legacy), Dawn Zulueta (Walang Hanggan), Lovi Poe (Legacy), Marian Rivera (Amaya), Nora Aunor (Sa Ngalan ng Ina), and Xyriel Manabat (100 Days to Heaven). Battling it out in the Outstanding Performance by an Actor in a Single Drama/Telemovie category are: Coco Martin (Maalaala Mo Kaya: “Kamao”), Gerald Anderson (Maalaala Mo Kaya: “Jacket”), Janus del Prado (Maalaala Mo Kaya: “Polo Shirt”), Noni Buencamino (Maalaala Mo Kaya: “Sapatos”), and Piolo Pascual (Maalaala Mo Kaya: “Sumpak”). Finalists in the Outstanding Performance by an Actress in a Single Drama/Telemovie Program category are Anita Linda (True Confession: “Ang Nawawalang Pag-ibig”), Angel Aquino (Maalaala Mo Kaya: “Manika”), Gina Pareño (Maalaala Mo Kaya: “Sapatos”), Iza Calzado (Maalaala Mo Kaya: Cross Stitch), Jane Oineza (Maalaala Mo Kaya: “Manika”), Maricel Soriano (Untold Stories: “Baldadong Puso”), and Slyvia Sanchez (Untold Stories: “Kahit Ako’y Mangmang”). Vying for the Outstanding Performance by an Actor in a Gag or Comedy Program category are: Michael V (Bubble Gang), Ogie Alcasid (Bubble Gang), Robin Padilla (Toda Max), Vhong Navarro (Toda Max), John Prats (Banana Split), and Jayson Gainza (Banana Split). Battling it out in the Outstanding Performance by an Actress in a Gag or Comedy Program are: Angel Locsin (Toda Max), Angelica Panganiban (Banana Split), Marian Rivera (Tweets for My Sweet), Pokwang (Toda Max), and Tuesday Vargas (Lokomoko).